The Speedway 1/4x25 air hose is made of high grade polyurethane. This air hose is lightweight and flexible and extremely durable in all climates. The PU hose is reinforced for higher pressure and longer life. The performance of the Speedway air hose is superior over conventional air hoses. This air hose has 360 degrees brass fittings. Bolton Power Air Hoses by Toolway are designed with the professional in mind. They are manufactured with HD tough flexible rubber that will not crack or kink under hard working conditions. They also have reinforced braiding for durability and a seamless inner tube which helps provide 300psi of working pressure and up to 800psi of burst pressure. The ends of the hose have been fitted with top quality NPT brass fittings. This unique hose reel from Crispo allows you to either mount the unit (bracket included) in your garage/workshop setting, or have the capability of using it as a portable reel for job sites, cottages, or helping friends and relatives with home projects. Features: Hose reel with 0.6 cm x 30.5 m (1/4 in. x 100 ft.) polyurethane air hose. Easy-mount bracket with hardware for installation. Eliminates tangles, bird nests, and kinks, Hose end protectors, 0.9 m (3 ft.) hose lead to compressor. Easy-wind, fold-away handle, Easy portability. 360-degree swivel base. Ergonomic foam comfort grip. Self-draining accessory tray. Contractor-grade steel body construction Open mesh polyurethane hose. Speedway 1/4" x 25' recoil PU air hose The Speedway 1/4x25 air hose is made of high grade polyurethane. This air hose is lightweight and flexible and extremely durable in all climates. The PU hose is reinforced for higher pressure and longer life. 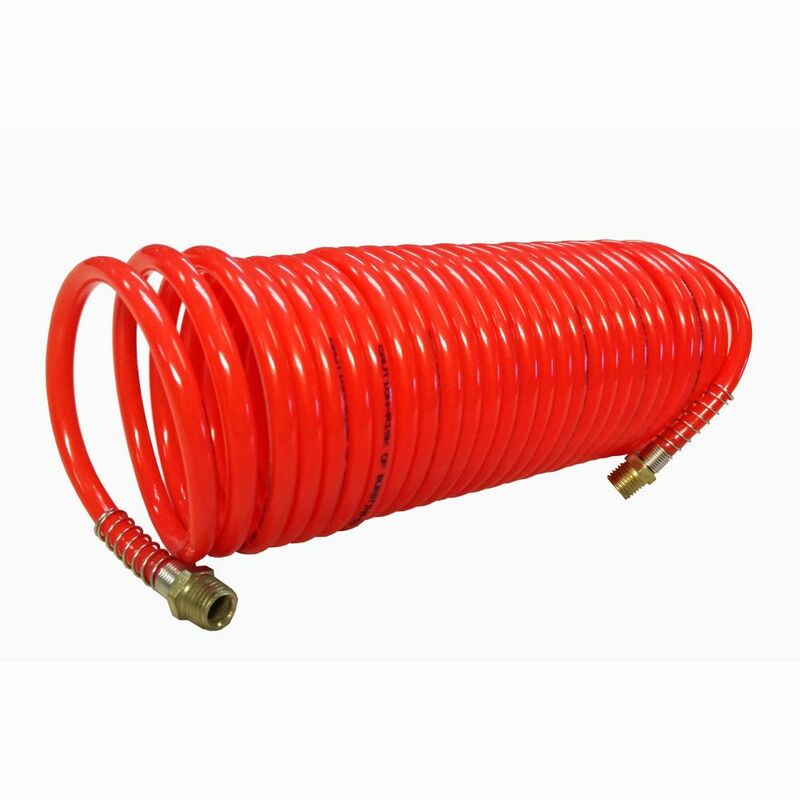 The performance of the Speedway air hose is superior over conventional air hoses. This air hose has 360 degrees brass fittings. Speedway 1/4" x 25' recoil PU air hose is rated 1.0 out of 5 by 2. Rated 1 out of 5 by JoeLaconte from Poor description Picture is of a black hose and I was sent a red hose. Rated 1 out of 5 by cklick from Not Polyurethane. I was expecting a Polyurethane Air Hose since that is what it said. I received a NYLON hose! they are stiffer and break easier over time. This is a NoGo Depot. What is the wall thickness of this tubing? What is a &quot;360 degree brass fitting&quot;. To me it implies a built-in swivel, 360 degree. But it certainly isn't! Mean it goes in the 360 degree.